The number of children in extreme poverty in Mesa County has skyrocketed under a Republican-dominated Board of Mesa County Commissioners. (FPL= Federal Poverty Level. A family of four is at the federal poverty level if they make an income of $24,600 in 2017. Under 50% of the FPL would be about $12,600/year. 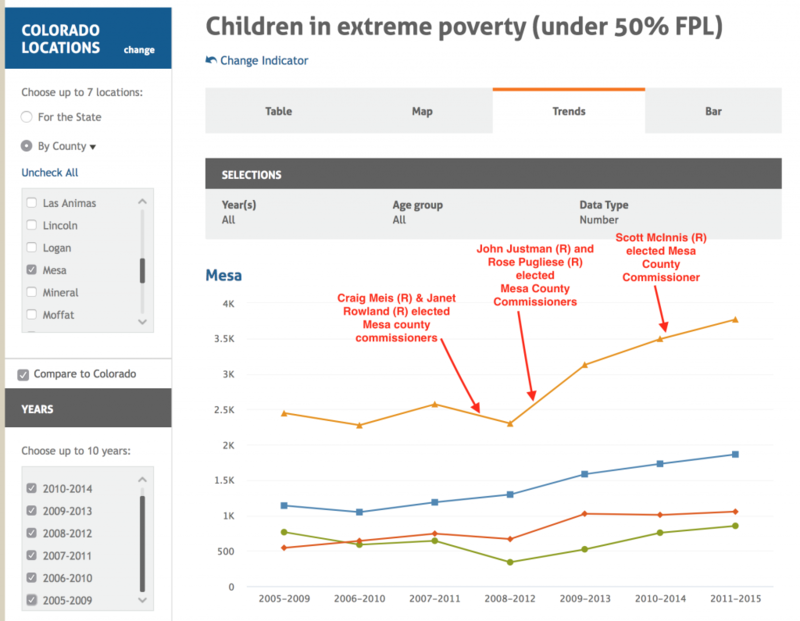 (https://aspe.hhs.gov/poverty-guidelines) Chart available (without red annotations) at Colorado Children’s Campaign. When was the last time a Mesa County Commissioner or a state-level elected official from Mesa County gave a public statement about the skyrocketing number of families and children suffering from extreme poverty in our county, or proposed possible solutions to the problem? Poverty is a touchy topic for Republicans. Republicans tend to view poverty as the fault of the poor, or blame it on the government, or both. They link poverty to laziness and believe poor people prefer being dependent on programs like Welfare and food stamps. Conservatives believe that poverty ends by making rich people richer. In return, they believe, the rich will spend more money, which will stimulate the economy and create more jobs for poor people. That’s why conservatives believe economic policies should be aimed at making wealthy people even wealthier, and that’s how everyone will benefit. Democrats have a more bottom-up view of how to address poverty. They believe that more opportunity and equality will reduce poverty, for example by making debt-free college a reality, ending systemic racism, treating mental illness and considering health care a human right, treating workers with respect and generating higher-paying jobs through the advancement of new technologies, like renewable energy. The last Democratic elected official who represented our area was voted out in 2008, when Bernie Buescher (D) lost to Laura Bradford (R) for the House District 55 seat by a margin of only about 600 votes. Bradford had a sewing business and no prior experience in government prior to being elected, but she directed her church’s handbell choir and was a devoted Republican. Buescher was a former CEO of West Star Aviation, had a law degree and was first elected to the Colorado Assembly in 2004. While in the legislature, he worked on expanding the Low Income Energy Assistance Program and legislation to use Federal Mineral Lease Revenues to create a “rainy day fund” for the State of Colorado. Buescher was recognized as “Legislator of the Year” by the Colorado Non Profit Association, The Colorado Economic Developers Council and the United Veterans Committee. He rose through the legislative ranks to serve as chair of the Joint Budget and Appropriate Committees and was on track to become the next Speaker of the House when Bradford beat him by about 1% of votes cast. On January 25, 2012, Bradford was arrested in Denver for drunk driving and possession of a handgun in her car. She did not run for office again. Despite the humiliating experience of having elected Bradford to the Colorado House of Representatives, Mesa County voters went full bore electing Republican representation at local and state levels after that, to terrible effect for the County. In 2008, number of kids suffering in extreme poverty in Mesa County began to skyrocket, according to data from the Colorado Children’s Campaign. By 2013, Mesa County’s child poverty rate had almost doubled. Today kids in Mesa County are still having a terrible time, according to recent news reports. Things will stay tough for Mesa County’s poorer citizens until voters here are finally squeezed so hard and in so much pain that they will welcome new, more Democratic ideas. Right wing leadership and their old-fashioned ideas about poverty and trickle-down economics have proven over and over that they simply do not work for kids or families. Five months of unprecedented obstruction by the Democrats? What the hell were the Republicans during during the eight year Obama presidency? They sure weren’t cooperating with anything!!! I see by the chart provided the real upturn in child poverty started in about 2010, which of course would have been the second year of the Obama administration. You remember that. It was when the big downturn in energy production occurred. When our population here in the valley started to decline, because the jobs ran out, and so did the paychecks. And the people that could, left. And here we are about five months into the Presidency of Donald Trump who promised jobs, jobs, jobs, while at the same time facing unprecedented obstructionism, by what Democrats call the “resistance”. If elections have consequences, then so does eight years of the Obama reign and five months of resistance obstructionism. Don’t you think it would be great if the party hacks, special interests and other ne’re do well layabouts could put aside their lust for power just long enough for the occasional visit to see the product of their handiwork. My guess is, it would be a pretty diverse meeting, bipartisan in composition. Greatness in a nation (as in a people) Is not that difficult to measure. All one needs to do is look around with the truth in mind. Speaking of looking with the truth in mind, the unemployment rate in Mesa County Colorado in January 2017, when Trump took office was 5.8%. Currently it is at 3.2%. Someone seems to be producing jobs. So pick one. The Republican Mesa County Commissioners? Or was it Trump? But that’s the problem with statistics. They don’t lie. They just get skewed around by liars that figure. Do you see any truth in that? When the unemplotyment rate went down during the Obama administration, the conservatives declared it was because of people leaving the job market, not job creation. Why is job creation all of a sudden now? I don’t remember that. Perhaps you could get me some links or names of conservatives that said that? It’s not that I don’t believe you, it’s just that I generally try to avoid answering hypotheticals, at least until they’re no longer hypothetical. It was just comments on the local news sites and so forth. Basically since the job growth occurred under Obama, it could only have been because of people giving up and leaving the workforce. Now, Trump get credit for creating jobs even if he didn’t do anything to cause it. Well, now Scott, that’s a problem inherent to politics. If it happens on your watch, you get the credit and the blame. I think probably workforce participation went down during the Obama administration because coming off Bush’s recession, people just felt like looking for work was a waste of time. You know looking for work is something people don’t really like to do, so it’s a lot easier to quit doing something you don’t like to do. And besides, all of us being good Americans, we want the President and our nation to succeed. That’s why we have elections. So if one way isn’t working, the people have the opportunity to peacefully change the course of their nation. Which brings us to your next problem. What kind of a democracy is it where the person who wins the majority of the votes, loses the election? Sooner or later, that issue will have to be addressed. And chances are, it will be, by a conservative Supreme Court, in a Constitutional Republic. Which brings us to Trumps theme song; you can’t always get what you want. Now, what do you suppose life has been like for the deplorables aka Tea Party folks for the past eight years? You know it pays to always consider the other guys predicament. It can give you some insight into the amount of will that has been created. Because eventually I believe that will, decides the issue. But of course your original question still remains as hypothetical as the sources you provided. Things are going to get better, better every day. Why you might ask? Well, because America needs things to get better. And we’re just glad we were able to help in some small way, aren’t we? Ya see, the guys going secular. But don’t say I didn’t tell you so. Maybe you ought to give him another look? Ok… But this article is about Republican rule in Mesa County, & poverty issues resulting from GOP ruled Mesa County. Stick w the topic please. Damn, well there I go again. 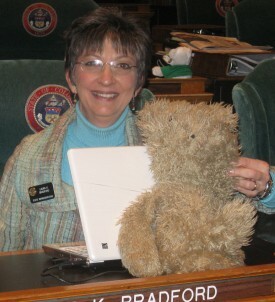 I thought what we were doing was trying to address the root cause of child poverty in Mesa County? You see that’s the one you missed. But how do I know that. Because Republican rule in Mesa County goes back a long ways..before dirt. and we’ve always been a boom and bust economy, even when the occasional Democrat did sneak in. At the risk of giving away my age, I remember when the GJ city counsel approved a new slaughter house, and in the same meeting, turned down a bid by Texas Instruments to locate here. Back in that day, you had a choice. You could work in the fruit or you could work in the ice house. Person handling four hundred pound blocks of ice out of railroad cars and then stacking it way up high in the ice house that used to be right next to where the depot is now. And of course, right down the street from that historical landmark; Jakes mule barn. What we’re discussing is not rocket science. It’s pretty much common knowledge if you’ve lived here long enough. Well you see Wiley, I don’t know what the Republicans during during. At least not in that department as I was kind of pre occupied with the no quarters knife fight in a phone booth, knock down drag out rumble in the jungle that we (the Tea Party) were totally engaged in, and purely defensive against the GOP status quo. And most of us, by that time were no longer registered Republicans, so we didn’t get the memo. Bingo. Wanna win in 2018, or for that matter 2020? Learn to squat with the little people. Look around before you start talking, and see who you need to be talking to. Everybody is talking about us. Don’t you think you should be talking to us? Do you think there might be some wisdom in talking to the people who have traveled down the path where you’re going? And it doesn’t matter whether you’re status quo DNC or you feel the Bern, those are just two peas in the same pod. A shared experience with no second place winner. You’re already on your way; (Town Hall Yellers). That’s a good start, but it’s not the tricky part, at least not when you’re dealing with the elephant. Don’t go into that without a real solid end game strategy. You’ve heard the old cliché; you won’t like watching sausage being made. It’s a cliché because it’s true. But I can guarantee (and have the scars to prove it) that there’s something out there that you won’t like watching being made a hell of a lot more….and that’s elephant toe jam. It mostly consists of pureed, slow insurgent’s. Sharp is the action and quick is the word. Our country is in a steep decline and it’s what people want. Beyond bizarre and accelerating faster than global warming.